Your home is one of your biggest investments. Though you value your home, you might be neglecting your roof. As a Miami Roofer, we see it all the time– homeowners don’t pay attention to their roof until something goes horribly wrong, which ends up putting a big dent in that investment. A small leak or a broken shingle can turn into a catastrophic event. You might be looking at water damage, damaged pipes, damaged vents, or replacing your entire roof if you let things get bad enough. Metal roofing materials are great in harsh weather, but even the sturdiest roof in the world needs an inspection once in awhile. Think about your car. If you take pride in your vehicle, you don’t wait until it breaks down to have it fixed. You take it to your trusted technician for regular maintenance, oil changes, inspections, and tire rotations. You know how many working parts there are, and you know the damage one neglected part can do to your whole vehicle. If you see a “check engine” light come on, or notice a clunking sound, you take your vehicle to the mechanic as soon as possible. You know it’s best for your technician to find potential issues before they become big problems– that’s why you take your car in. With roofs, it might not be as easy. You spend more time in your home than your car, but your car’s a little better at letting you know when something is wrong. In fact, you might not even think about your roof until something is wrong. You should never have to worry about your roof, and you should never be caught off guard by a nasty surprise. That’s why it’s important to inspect your roof at least twice a year. You wouldn’t neglect your car, so you shouldn’t neglect your roof. If we haven’t had any extreme weather during the year, it might be okay to only inspect your roof once annually. This is Miami, though, so we’re bound to deal with heavy rain and strong winds at least a few times a year. 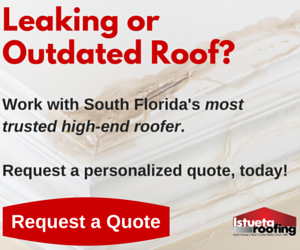 As a Miami roofer, we have to recommend you inspect your roof at least twice a year. We recommend you inspect your roof after any extreme weather event, too. Some shingles become easily damaged by high winds, and those damaged shingles can lead to damaged infrastructure. Metal Roofs – Metal roofs are extremely durable, and they’ll last a lifetime if you maintain them properly. Check for any signs of rust, pitting, or corrosion. Also check for open seams or joints. Asphalt Shingles – If you see a lot of granular asphalt material in your gutters, your shingles are wearing out or damaged. Also look for bare spots in your shingles, and look for signs of warping, tearing, or shingles curling up. Asphalt roofing materials have a granular surface, use binoculars for inspection. Cement, Tile, and Slate Shingles – Much like metal roofs, these roofs are durable. If you notice broken, chipped, or missing pieces, your roof is in need of repair. Check flashings – The metal pieces in a roof that cover interruptions in the roof surface (vent pipes, chimneys, dormers) are called flashings. If these are damaged or show signs of rust spots or cracked caulk, call your trusted roofer as soon as you can. Boots – If the rubber boots around your vent pipes are worn or cracked, there is a problem. Moss – If you have large masses of moss and/or lichen, it might signal a decaying roof. In the fall, use roof-specific moss killer. Remove dead moss with a broom, and then apply more roof-specific (never lawn-specific) moss killer as needed. If you see any of those warning signs, consult a professional immediately. Just like with a car, you can inspect your roof yourself. You can learn what to look for, and you can likely find most problems with your own inspection. Just like with a car, though, you have to keep up on those inspections and make sure everything is operating properly– that’s the difference between a functioning roof and a water-damaged home. You probably have a regular technician for your car. You trust that mechanic to make sure everything is operating at peak efficiency, and to make sure you won’t encounter any unwelcome surprises. Think of your roofer like a trusted mechanic. We’re happy to inspect your roof at any time. If we inspect your roof, you’ll have real peace of mind. We know what to look for, and we know how to fix it if there is a problem. Whether you inspect the roof yourself, or rely on a trusted professional, make sure you protect your investment. Your roof protects you from the wind and the rain– make sure you do your part to protect it, too.